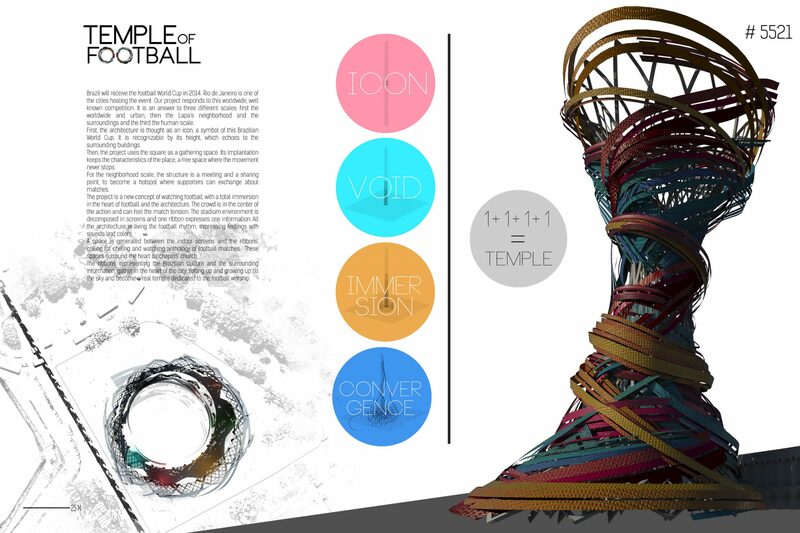 Temple of Football | gURROO - A new generation of innovative minds. Brazil will receive the football World Cup in 2014. Rio de Janeiro is one of the cities hosting the event. Our project responds to this worldwide, well known competition. It is an answer to three different scales: first the worldwide and urban, then the Lapa’s neighborhood and the surroundings and the third the human scale. First, the architecture is thought as an icon, a symbol of this Brazilian World Cup. It is recognizable by its height, which echoes to the surrounding buildings. Then, the project uses the square as a gathering space. Its implantation keeps the characteristics of the place, a free space where the movement never stops. For the neighborhood scale, the structure is a meeting and a sharing point, to become a hotspot where supporters can exchange about matches. The project is a new concept of watching football, with a total immersion in the heart of football and the architecture. The crowd is in the center of the action and can feel the match tension. 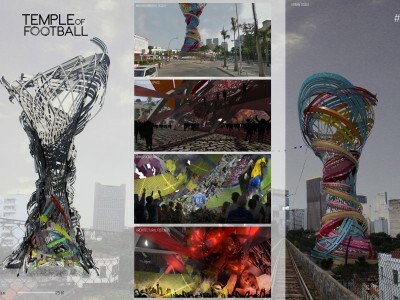 The stadium environment is decomposed in screens and one ribbon expresses one information. 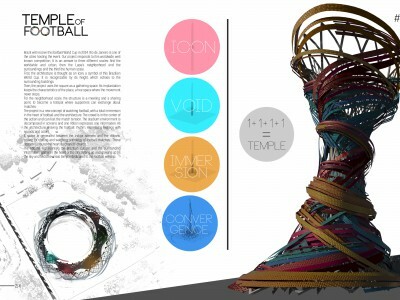 All the architecture is living the football rhythm, expressing feelings with sounds and colors. A space is generated between the indoor screens and the ribbons’ coiling for chilling and watching anthology of football matches. These spaces surround the heart as chapels’ church. The ribbons, representing the Brazilian culture and the surrounding information, gather in the heart of the city, rolling up and growing up till the sky and become a real temple dedicated to the football worship.